So I haven’t posted anything in a while. I have a dozen or so reviews and recaps to post, including details from a righteous trip to CO. The guys have been giving me a hard time about my lack of writing but work/life has been sucking up all my time. 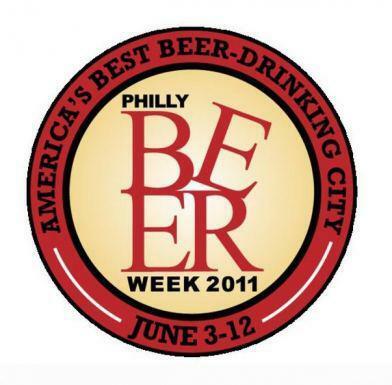 But on this the most holiest of beer drinking seasons (Philly Beer Week) I figured I should at least throw up a progress report of some of the things I have hit so far. On the first day of beer week I couldn’t just let the day go by without a new brew. Since I wasn’t going to be able to make the Opening Tap or cruise around with the H.O.G. like our beer guru Miracle Max, I decided to hit G-lo up for a brew lunch. It took a dozen or so texts and emails but I managed to liberate him from his office for lunch at Perch Pub. 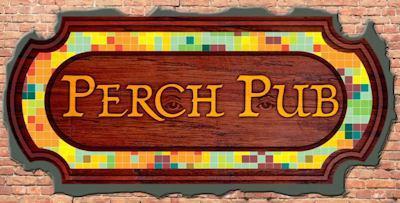 For PBW Perch had a line-up of “Rare and One Off Brews”, what’s not to love? I went with a Hop God from Nebraska Brewing Co. 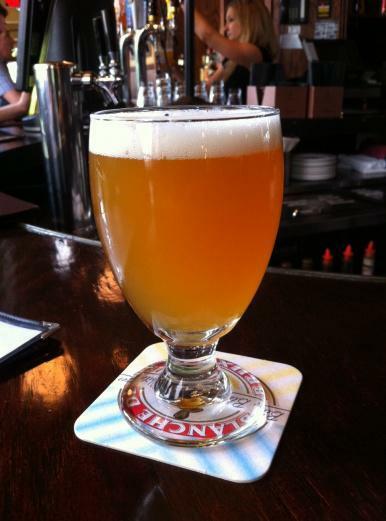 Hop God is described by the brewer as a “crossbreed of a Belgian Triple and a West Coast IPA”. The description is all you need to know. This brew starts our rich, earthy with the spice and citrus you’d expect in a Triple and then it finishes with big IPA hop bitterness and astringency. This was my first Nebraska brew and I definitely want to try more. The Hop God is a big bold beer the covers the 9% ABV very well. 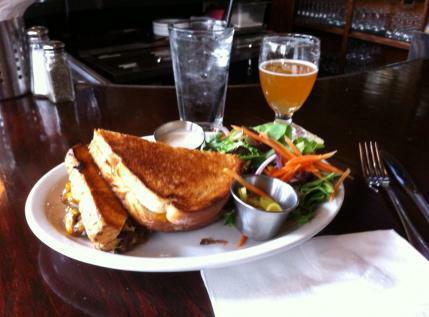 It is best enjoyed with food and the Perch’s Jacob’s Ladder short rib sandwich was a perfect match. Sharp cheddar, slow cooked short rib on a two big pieces of country white toast. YUM! That “Work/Life” thang that has kept me from writing is also going to limit my PBW fun this year so when I can mix a little family lunch into the Beer schedule the results can be delicious. On Sunday, the 3rd day in PBW’s 10 day week, I headed to the Uno’s in Maple Shade for lunch with family. Not a place many would think when they think good beer but Uno’s has a fantastic beer scene and is much more family friendly than a dark gastropub. 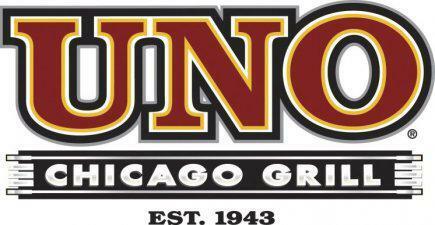 For this weekend during PBW the Maple Shade NJ Uno’s had a great line-up of 9 different IPA’s on tap. I went with a four IPA flight that included Breckenridge’s Lucky U, Green Flash’s Palate Wrecker, Terrapin’s Hopzilla, and Avery’s Maharaja. (shown in this order, left to right, below). 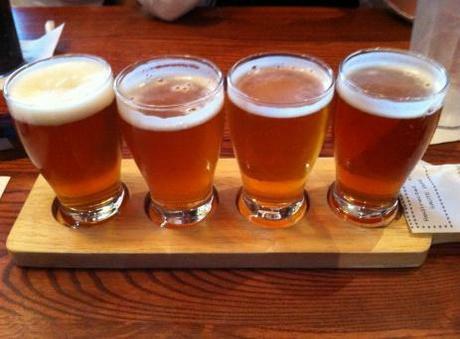 The quick tasting was not enough to do a full review on each brew but they were all great beers. If I had to pick a favorite I would go with the Breckenridge Lucky U. The Breck seemed to have more depth of flavor than the others and was more than just a hop bomb. The tasting session was made perfect by our server Kelle who gave us awesome service and was just as pumped up about Beer Week as I was. The PBW loves seems to be everywhere. We are truly living in the golden age of beer! So that’s the progress report so far. I think the boys are hitting more PBW stops on Tuesday and Thursday. Expect more reports to come. Cheers!